It is not necessary to travel to India to meditate or to find tranquility and energy… The recipe for peace is really at your fingertips. Meditation is a method to calm your mind, gain concentration and recharge the energies, and the act of meditating is a habit that must be improved daily: benefits can be harvested over time. The benefits of meditation are most effective when it is practiced daily and it can be done as the first thing in the morning and then again at the end of the day. So the first tip to find peace: do not expect to achieve enlightenment or feel something extraordinary in the first few attempts. Instead, try to listen to your body and your mind through silence. Ready to start? So take a few minutes to read the eight basic steps to meditation… and good practice! No specific location is necessary, but the place has to be silent and far away from possible disruption and external distractions. It’s best to find a quiet location where you won’t be disturbed. This should be a private spot free from external disturbances. You should feel safe, at peace and comfortable in it. After you pick the spot, clean the space around it. We guarantee that only 20 minutes of your day are enough to take care of your inner world. Choose a time of day that is calm for you. Clear your mind. Loosen yourself up. Take a few deep, slow breaths. Find a position that’s most comfortable for you. Whatever posture you choose, sit upright to facilitate the flow of energy. The most important rule is that meditation can be practiced anywhere, as long as you’re comfortable. The lotus flower is the best posture for meditation. In the beginning it is normal to feel uncomfortable, with possible pains in the spine or the urge to move around at all times. If you feel very uncomfortable, sit on a soft cushion and support your back against the wall, so that the spine is well aligned and straight. There is no need to sit cross-legged on the floor unless that is comfortable for you. You can sit on a chair or sofa or on the floor with your back against a wall. The goal is to sit as upright as possible while still remaining comfortable. It is very important to learn to breathe properly. In fact, a great trick is to focus on your breath every time you feel your thoughts wander. Start breathing deeply for 1 min, always through the nose. To calm the mind, inhale at 8 sec and exhale at 16 sec. Try taking a few “cleansing breaths” by inhaling slowly through your nose and then breathing out through your mouth. After a few cleansing breaths, continue to breathe through your nose with your lips gently closed. You can control the force of your thoughts that travel through your mind. It is easier than it sounds: during meditation, every time you think about something, watch the thought and do not feed it. You can ignore it with the previous step, through your breath. In a few moments, fixed thinking loses strength. 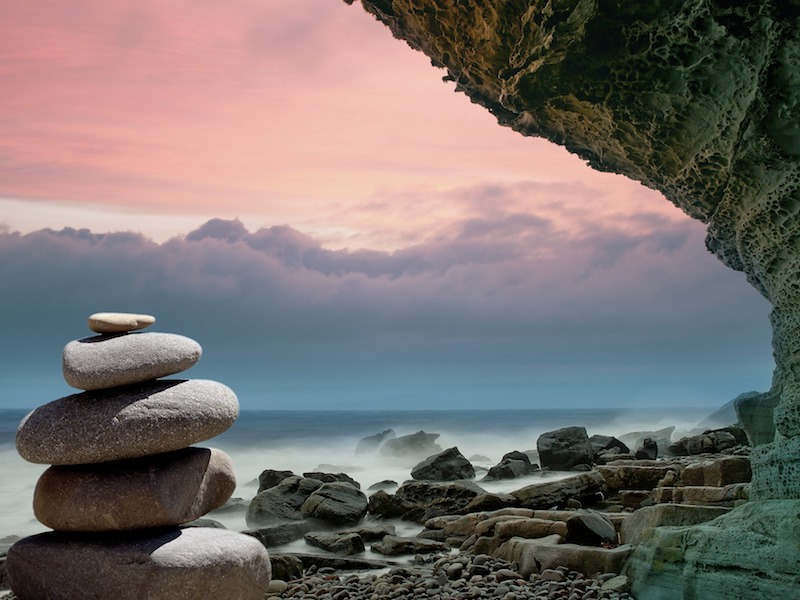 If silence bothers you, begin your meditation with a relaxing sound, binaural beats could help you tune into the moment and create your peace of mind. Once you become familiar with the practice, try meditating in silence and focusing on your own thoughts. Some meditation techniques suggest you to focus on a fixed point with their eyes open. It could be the flame of a candle, the design of a mandala or any other object you treasure. Associate the object with a positive quality, a phrase, or a mantra that you can repeat in silence over and over again. If you can not set your mind free, imagine that you have to write a new white page in your life’s book. If you cannot, go back to your breathing. Stopping certain thoughts is the goal of the practice itself. This is particularly true if you are caught up in a spiral of negative thinking and would like to use meditation to alleviate the ruminative process. When you stop flooding your brain with fear and worry about the future or resentments from the past, this has a profoundly positive effect of resetting your emotional state to calm and peaceful.